On July 4, 1897, Hubinger Pastime Park opened. The park featured a variety of activities and facilities which included the ride "Shoot the Chutes," an auditorium and theatre, race track, and athletic field. Shoot the Chutes was an amusement park ride sixty-seven feet high and three hundred feet long. People would ride a flatboat down the chute and into a shallow pond. Of the events at the Casino (auditorium and theatre), some highlights were the speakers William Jennings Bryan and Carrie Nation. The John Phillips Sousa Band, the United States Marine Band, and the U.S. Army Band also performed there. The athletic field was home to the Keokuk Central Association baseball team and the Keokuk High School football games. Teddy Roosevelt paid his first of three visits to Keokuk April 29, 1903. On this visit he spoke in Rand Park and pushed the button to reopen Hubingers newly rebuilt factory. 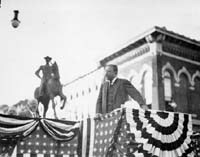 Roosevelt visited Keokuk to speak in 1912 when he was running for president on the Bull Moose ticket. He spoke at Third and Main Streets as seen in the photo at right. The statue of General Samuel Curtis can bee seen in the background. Built in 1910, the federal building opened at 7th and Blondeau Streets. Now on the National Register of Historic Places, the federal building was the site of the U.S. District Court until 1957, and the site of the U.S. Post Office until 1990. 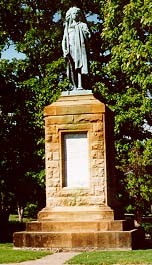 The statue on the Chief Keokuk Gravesite in Rand Park was dedicated in 1913. The statue replaced the previous stone top of the monument. As legend has it, the idea for the statue came from some hoodlums who stole a wooden cigar store Indian and placed it on the monument. 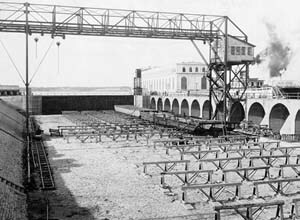 Work was completed on the Keokuk Lock and Dam #19, and Powerhouse in 1913. At the time it was the largest electric generating plant in the world. This photo shows the dry dock area of the old lock where boats were worked on. This area can still be seen between the old lock and the new lock, although it is no longer used for boat repair. 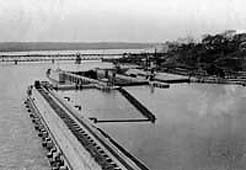 This photo is a view of the lock from the north in 1918. The old bridge can be seen in the background. 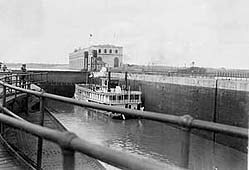 This photo shows the Mamie S. Barret riverboat going through the old lock on June 26, 1925. Hydroelectric power lead to the 1915 creation of Keokuk Electro-Metals by George Weissenburger, Keokuk Steel Castings by Walter J. Miller, and Midwest Carbide by Thomas Wettstein. 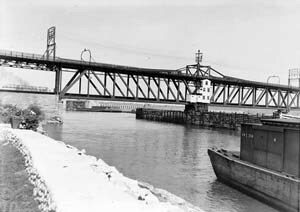 In 1916, the old railroad bridge was remodeled into a double-decker bridge for railroad traffic underneath, and auto and pedestrian traffic above. This bridge was replaced in 1985, and is still used for railroad traffic. The Iowa side of the old bridge is currently used as an observation deck.